When I/O device (short for Input/Output device) error appears, the computer system is unable to read or access files from your hard drive or removable disk. This error could happen to external hard drive, USB flash stick, DVD, and SD card, with an alert message on computer screen as “The request could not be performed because of an I/O device error”. In this tutorial, we are going to find out how to fix I/O device error in Windows 10/8/7. Poor connection, which interrupts the communication between computer and hard disk. Incompatible driver, which makes “the request could not be performed”. Hard disk error, which causes malfunction to the system. The reasons behind I/O device error vary from case to case. We list above some common reasons that may be possible to experience. Before heading to the solutions of I/O device error, here are two tips worth a look. Firstly, do a quick troubleshoot by rebooting your computer, which will save you a lot of time if the problem is fixed after reboot. Secondly, use a file recovery software to scan your disk drive to extract data, which is more important than merely fixing the I/O device error for many people. Now, if it is still necessary, you can keep reading for I/O device error solutions. Poor connection usually results in the problem of I/O device error, so the very first thing is to make sure the cable and ports on both sides are well-functioning. Check if the cord is firmly connected to the two ports. Connect to another port on your computer to test if the original port is faulty. Change to another cable or computer to rule out potential factors. This solution seems unnecessary but usually turns out to be very effective, and it won’t cost much time anyway. Let’s move to the next solution if you have ruled out the possibility of connection problem. When you experience the input/output device error, it usually indicates that the device is not working properly. You can check the device status in Device Manager and take measures accordingly. Step 1. Press Windows and R key at the same time, then type devmgmt.msc in the box and hit Enter. Step 2. 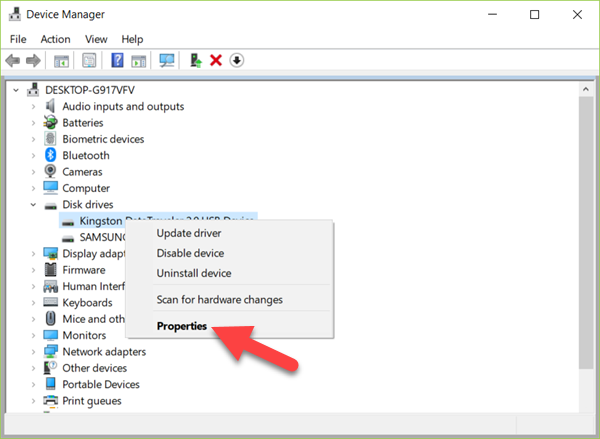 In Device Manager, expand Disk drives, then right-click on the device with the error. Step 3. Choose Properties, then check Device status in General tab. Step 4. If the device is not working properly, then open Driver tab. Step 5. 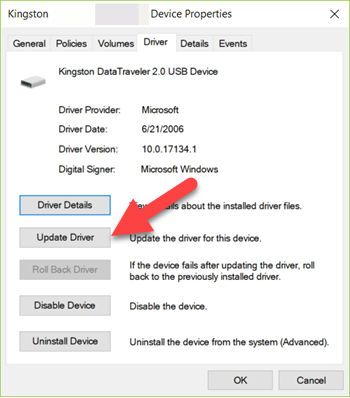 Click Update Driver > Search automatically for updated driver software. Step 6. Follow the step-by-step wizard to finish updating. Step 1. Press Window and R key together, then type cmd in the box and hit Enter to open Command Prompt. Step 2. Type chkdsk G: /f/r/x in Command Prompt. Replace “G” with the drive letter of the device with I/O error. Step 3. Hit Enter to execute the command. This command will check and repair disk errors in your hard disk. Once it is finished, try to access the disk drive again to check if the problem is fixed or not. Note: you may need Administrator privilege to launch Command Prompt. In none of the above solutions fix the I/O Device error, then it is possible a hardware issue. Please contact your device manufacturer or a local store to repair it change to a new one. Now “The request could not be performed because of an I/O device error” should no longer exist. In case you lose precious files, like photos and videos, after the repairing, have a try with a photo recovery software to get them back.